The world's biggest fighting game tournament is going down this weekend, and we'll have full coverage of everything happening in and around EVO 2013 here on EventHubs. 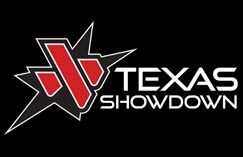 You'll be able to check the site for all of the latest results, live streams, battle logs, bracket updates and more updated constantly throughout the weekend, as the world's best fighting game players descend on Las Vegas, Nevada at the Paris hotel. There will be a panel from Capcom USA staff and NetherRealm Studios will announced a 5th DLC character for Injustice: Gods Among Us, likely on Sunday, possibly before the finals for that game plays out. 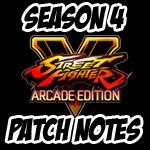 Hit the jump to check out our full preview of the event, including notable players, a schedule, stream information, polls to vote on which players will win SSF4 AE v2012 and UMvC3 and quite a bit more. Date, time and location: July 12-14, 2013. Action starts at 8 a.m. PDT / 3 p.m. GMT on both Friday and Saturday and 10 a.m. PDT / 5 p.m. GMT on Sunday. It will be held at the Paris hotel in Las Vegas, Nevada, USA. 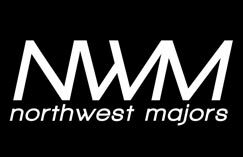 North America: AGE|NYChrisG, EG|Justin Wong, coL|Filipino Champ, EG|PR Balrog, EG|Ricky Ortiz, EMP|Dieminion, FNATIC|Perfect Legend, EMP|Flocker, RZR|Latif, MH|Ray Ray, AGE|Flash Metroid, AGE|WolfKrone, Mike Ross, NGL|Marq Teddy, EMP|IFC Yipes, AGE|Fanatiq, AGE|Knives, AGE|Vangief, AGE|Snake Eyez, TS|Arturo Sanchez, EG|fLoE, LxG|Infrit, MH|Unkn0wn. 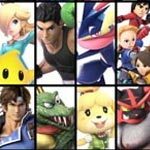 Japan: MCZ|Daigo, RZR|Fuudo, MCZ|Tokido, HORI|Sako, MCZ|Mago, Kazunoko, Nemo, Bonchan, EG|Momochi, Uryo, Haitani, Dogura, MOV, Eita, MameSpider, Abegen, VX, G.X., RZR|Itabashi Zangief. Europe: WW|Ryan Hart, Alioune, WDM|Luffy, WW|Andreas, WW|F-Word, Popi, Starnab, CG|Problem X, CDV|Whiteblack and Zak Bennett. Else where: Infiltration, DM|Xian, AVM|GamerBee, CafeID|Poongko, HumanBomb, Qanba|Xiao Hai, KaneBlueRiver, Dark Jeiwa and Laugh. And many more than we could possibly fit in here. WW|Ryan Hart is hosting a 7v7 SSF4 AE v2012 Europe vs. USA tournament on Friday night. 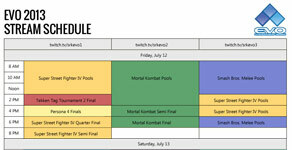 There's a 3v3 SSF4 AE v2012 event featuring competitors from around the globe on Friday. 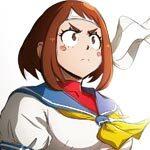 Skullgirls has a side tournament running with a guaranteed prize pot of $2,000 USD, it takes place Friday and Saturday. 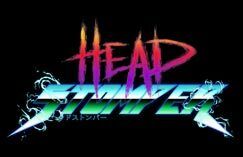 ST Games is a set of four SSF2T tournaments hosted by Super Turbo Revival. 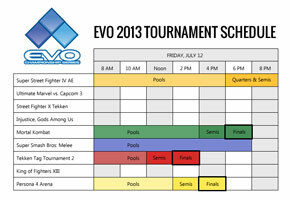 Who will win the EVO 2013 Super Street Fighter 4 Arcade Edition v2012 tournament? Who will win the EVO 2013 Ultimate Marvel vs. Capcom 3 tournament? Official streaming duties will be handled by Team Spooky and iPlayWinner. You can find a full breakdown of brackets here. Contributions to this story by Zanpakto.